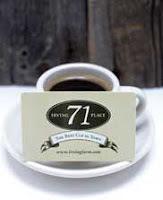 71 Irving Place is a great place to go solo or with friends when you need an afternoon pick me up. Always crowded, the patrons range from the folksy artist, to the uber hip NYU students, to the ever present struggling actor, to professionals wanting to pretend they are too cool for Starbucks. The coffee is fresh from Irving Farm located in upstate NY on the Hudson Valley. Better yet, the snacks give a new name to "cafe" food. The California Bagel - toasted with cream cheese, red onions, cucumbers and tomatoes bring me back to my Berkeley days. Other favorites include the Mediterranean sandwich and fresh quiches served up daily. For non coffee drinkers, I favor the Arnold Palmer - Ice tea + Lemonade. The ice tea perfectly offsets the sweetness of the lemonade. Best of all, the setting is a quaint coffeehouse located in one of the most "non NYC" areas - Gramercy Park. Walk down the steps and you feel transported away from the Starbucks and Coffee Beans of the world. While it's not the best place for computer work (laptops not allowed during "crowded times"), there are some outlets available at the tables along the walls. Most however bring a good book and pretend to read while eavesdropping on neighboring conversations. Anything from philosophical conversations about religion to investment deals being brokered, to the oft-struggling actor recounting his latest audition for an off-Broadway play. When you find yourself wanting a quick break from the fast paced Manhattan life, stop in at 71 Irving Place to relax, read, and gossip about your neighbors. What's better than that?